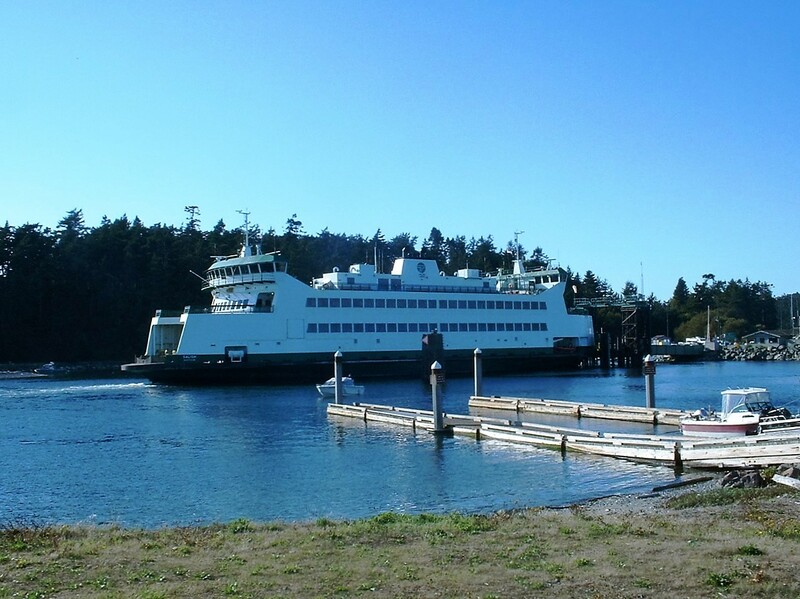 On Friday September 11, the first day of the 2015 Port Townsend Wooden Boat Festival, I was on one of the new Washington State Ferries crossing Admiralty Inlet from Whidbey Island to Port Townsend. The morning was beautiful, one that you admire living in the Northwest, a clear day with not a cloud in the sky and a flat sea with tide rips showing as the tide changed. When fall and winter storms buck the tidal flow this area can be a nasty place, as Admiralty Inlet is the entrance to Puget Sound from the Strait of Juan de Fuca, both large bodies of water where tidal movements can be quite severe. 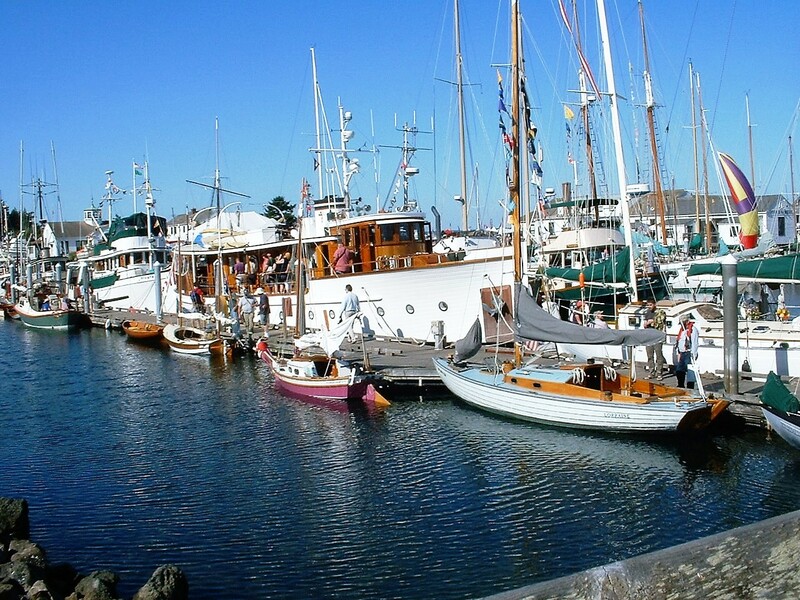 view the Western Flyer during the festival and I was anxious to see the renovation of this historic sardine seiner. 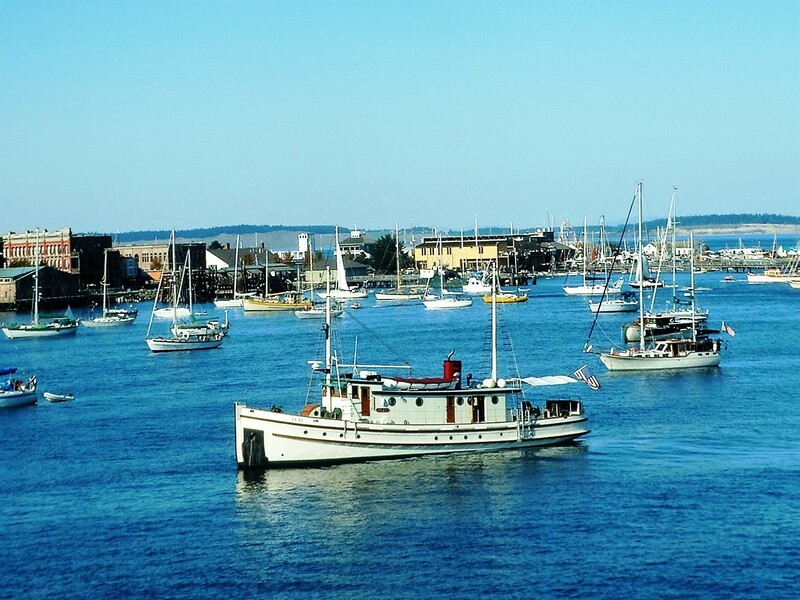 It was beautiful when it was launched in 1937 at the Western Boat Building Company in Tacoma, Washington, and became famous in 1940 when chartered for a six week trip by author John Steinbeck and biologist Ed Ricketts to explore the Sea of Cortez. 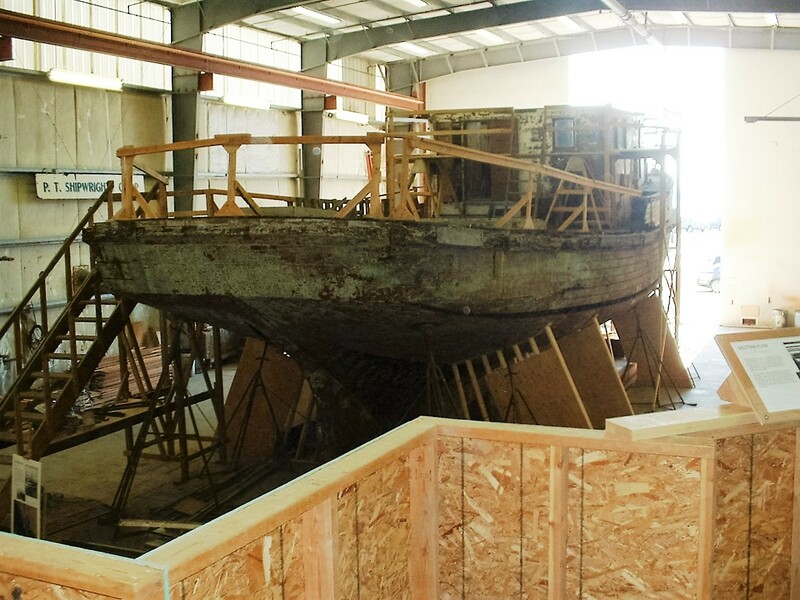 She’s also an example of a typical sardine seiner built at the peak of the huge California sardine fishery. The ferry arrived well before noon. I walked off and down Water Street to the Festival on the northeast end of the waterfront at the boat haven, looking for the Pope Marine building where I could get information about the Western Flyer’s location. Once found there was a notice that it was not open until noon, so I called Mike Fleming, a retired NOAA Corps officer living in Port Townsend. He had volunteered to take me to where the Flyer was located if I ever got there. 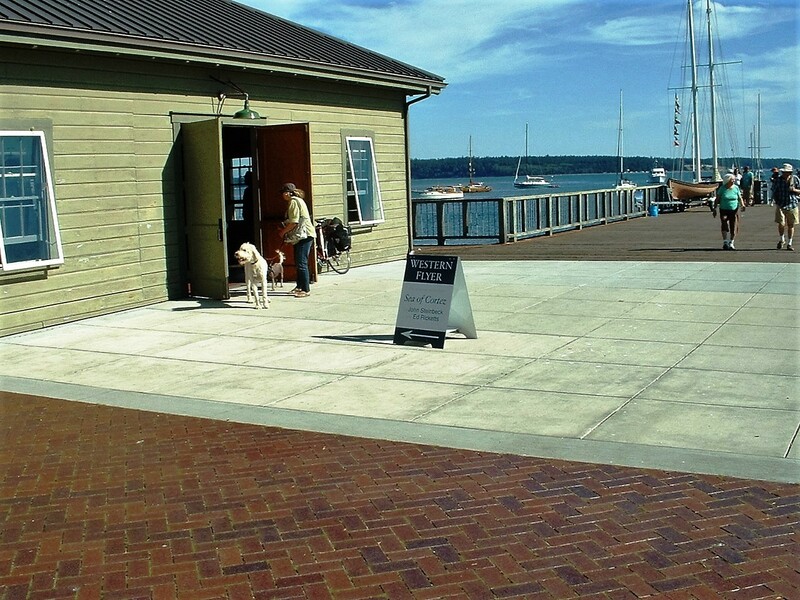 He responded and we were off to the opposite end of town, the southwest side of the waterfront at the Port Townsend Marina. 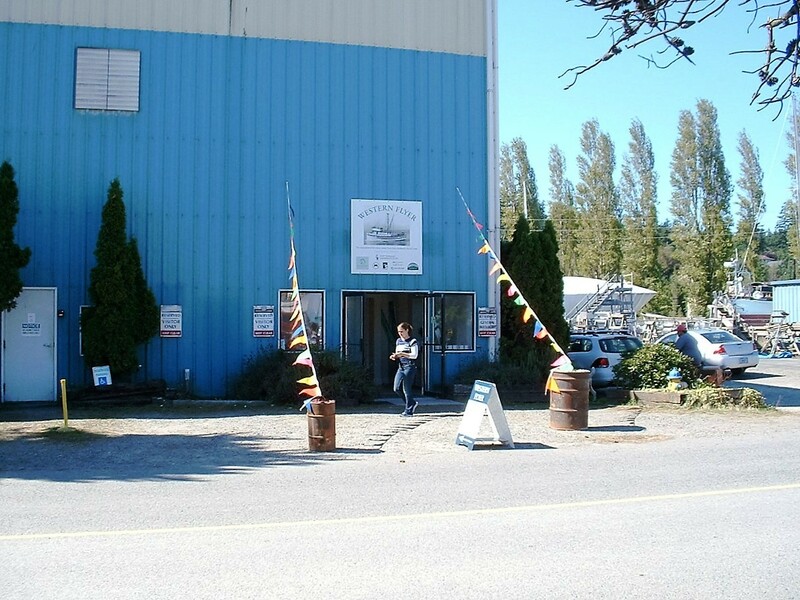 We approached a large enclosed structure with a door at the corner and a sign above it: Western Flyer. We entered a small room where we were greeted, signed a registry and I looked up through an open side door to see the stern of the boat. It had changed from what I had last seen before she was sold to John Gregg, who started the process of restoration. She had been in a deplorable state, having been raised from the bottom of the Swinomish Slough not once but twice. Receiving permission to take pictures, I went up on the balcony and took one of the entire vessel, showing the beautiful stern as well as the curvature of the underwater lines. At that moment I could imagine seeing her after being refurbished, as she was when launched in Tacoma some 78 years ago. The amount of work that has gone into the project at this point, getting off layers of paint and barnacles to determine what wood is useable, not to speak of the mud that must have been in the bottom of the vessel was impressive. I inquired about boarding her. I wanted to see the inside of the house because I hadn’t had access before the sinking and wanted to make sure I had drawn it correctly for Kevin Bailey’s book. He had a penciled sketch that he received from the Petrich family, a copy of which he passed on to me. I was assigned a guide because of the open hatches that weren’t fenced off, and we went up to the deck and into the house. stateroom. 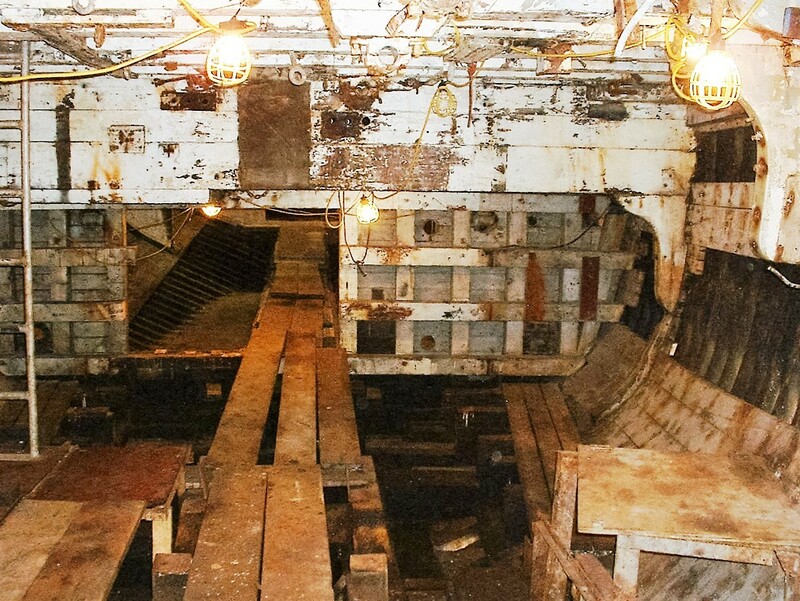 Now there was only one bunk instead of two, and there was a built-in chart cabinet on the bulkhead alongside it. 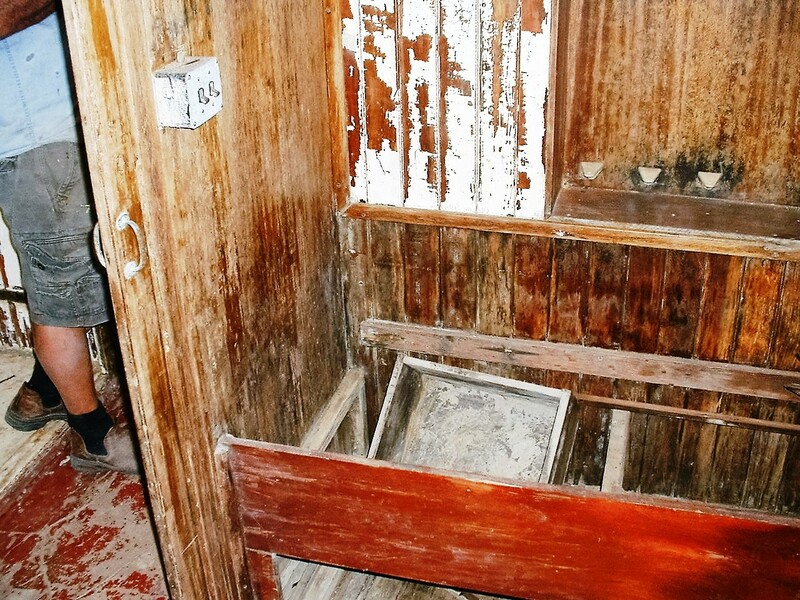 I believe that the charts were stored rolled up vertically in the wall with the door hinged at the bottom, so when it was opened it would form a small chart table above the bunk. There was an additional modification, a sliding door installed on the side of the cabin leading into the passageway, which provided two different accesses to the stateroom. 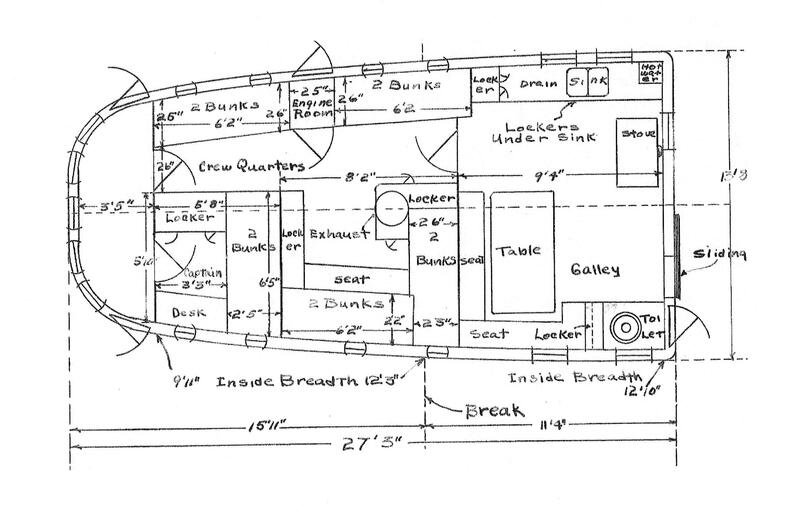 I assume that these modifications were done by Dan Luketa when he purchased the vessel and converted her to a trawler, which required only about the half the crew members than when she was a seiner. By the time I arrived back at the Pope Marine Building at the other end of town it had been open for a number of hours and there I met Michael Hemp, who was a Western Flyer consultant and historian with The History Company out of Carmel, California. 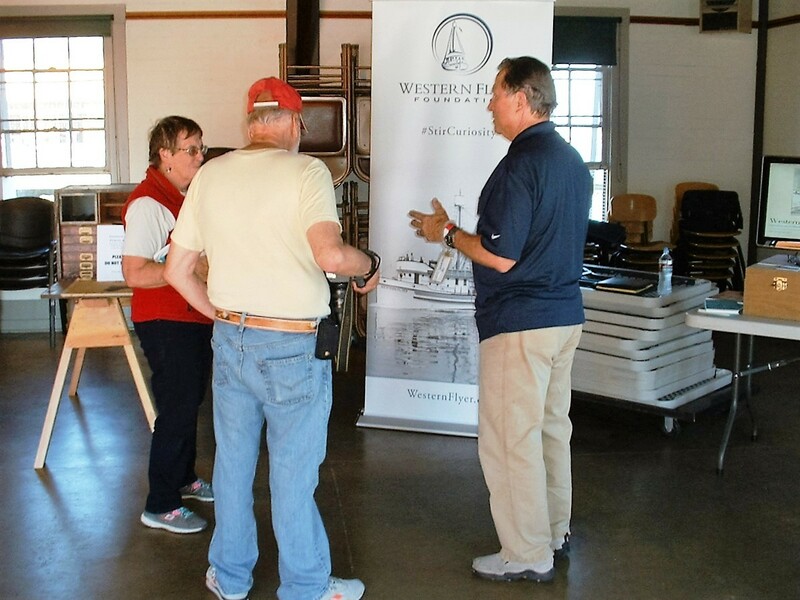 He answered guests’ questions about Steinbeck and Ricketts and their connections with the Western Flyer and Monterey’s Cannery Row in California. I missed talking with Alan Petrich, as he was scheduled to be at the building on Saturday. satisfaction of having finally boarded and inspected the Western Flyer for the first time. This entry was posted in boat building, California sardines, Environmental History, Fishing, History of Science, History of Technology, Maritime History, Ocean fishing, Pacific Fishing History Project, World History and tagged Allen Petrich, California sardines, Dan Luketa, John Steinbeck, Kevin Bailey, Port Townsend, sardine fishing, The Log of the Sea of Cortez, Westerm Flyer, Western Flyer. Bookmark the permalink.